The scene at my desk earlier this week. 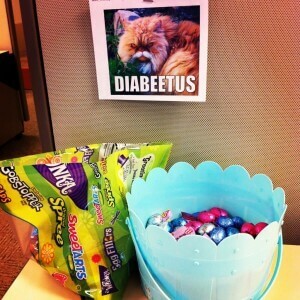 Diabeetus cat wants you to have some Easter candy. Watching: Finally watched Walking Dead from last Sunday. Can I mention how much I HATE the Governor? What a dink. Also, watching a lot of HGTV since we’re seriously looking into getting our house listed in the next 45 days. Thinking about: Home improvements and SPRING. It’s been super cold here (again) the last couple of days, and a snowstorm is apparently heading our way tomorrow night. I could really use some 50 degree temps, some green grass and open house windows. Reading: Sadly, I haven’t read a book in a while. I have a bunch queued up in my Kindle and books from friends sitting on my nightstand, but haven’t read anything yet. Looking forward to: Getting our bathroom repainted this weekend. Once step closer to listing our house! Also, things “getting back to normal” so we can see about this baby business. Making me happy: Knowing that we’re actually working on our house…and feeling closer to finding our new “forever” home. 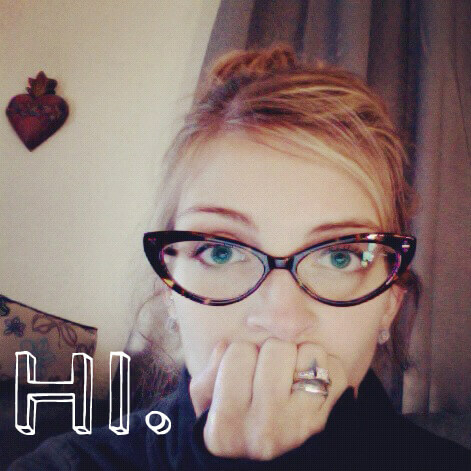 You are currently browsing the blogged bliss blog archives for February, 2013.